A referendum will be held on 23 June on whether the UK will remain a member of the European Union or not. Here's a guide to the two groups currently battling to become the official Leave campaign. Click here to read about those heading the Remain campaign. The two main campaigns are Vote Leave and Leave.EU/Grassroots Out. This group was launched on 9 October 2015, and comprises a cross-party group of MPs and peers from the Conservatives, Labour, UKIP and other parties. It is funded by people of different party affiliations including City millionaire and Tory donor Peter Cruddas, Labour's biggest private financial backer John Mills and Stuart Wheeler, a Tory-turned-UKIP donor. Conservatives for Britain, created by Tory MP Steve Baker, whose president is Eurosceptic former Conservative Chancellor Lord Lawson. The group says the UK's current relationship with the EU is "untenable". The Labour Leave campaign - (although almost all Labour MPs back Britain's continued EU membership). In March, Labour Leave's Gisella Stuart succeeded former Tory chancellor Lord Lawson as overall chair of Vote Leave. Business for Britain, which wants big changes to the UK's relations with the EU. It has affiliated to the group but remains a separate entity. Martin Bellamy, chairman and CEO of Salamanca Group, has joined Vote Leave's campaign committee as has John Longworth, the former director of the British Chambers of Commerce who quit after a row over his support for EU exit. Vote Leave is being run by Taxpayers' Alliance campaign group founder Matthew Elliot, who organised the successful 'No2AV' campaign in the referendum on reform of the Westminster voting system, and Dominic Cummings, a former aide to Conservative cabinet minister Michael Gove. 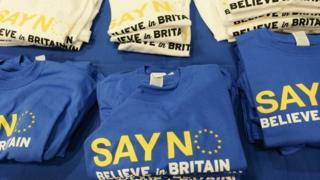 The group is being backed by Mr Gove, who is co-chairing its campaign committee, as well as four other members of David Cameron's Cabinet who are backing EU exit, Iain Duncan Smith, Theresa Villiers, Chris Grayling and John Whittingdale. Mayor of London Boris Johnson is another key figure. The group hopes he can win over undecided Conservatives and reach others - including younger voters - with his particular brand of campaigning. Douglas Carswell, UKIP's only MP, has broken ranks with his party leader to support the group as has the party's former deputy chair Suzanne Evans. Also on board is Nigel Dodds, the Westminster leader of the Democratic Unionists Party. Leave.EU was initially called The Know and rebranded when an amended referendum question was proposed. Founded by UKIP donor Arron Banks, it was backed by leader Nigel Farage, who billed it as an "umbrella group" of anti-EU campaigners. Mr Farage and Leave.EU have since become part of the Grassroots Out Movement after its launch in January. The cross-party group is also being backed by Labour MP Kate Hoey as well as ex-Conservative minister David Davis, among other politicians. Also backing GO is former Respect MP George Galloway and DUP MP Sammy Wilson. It is holding a series of events across the country to try and mobilise support, setting up stalls in 500 locations on a single day. It says its goal is to bring together existing leave campaigns and get them to work as one in local areas. Leave.EU and Grassroots Out have effectively merged for the purpose of trying to secure the official lead campaign status for the Out side. It will be up to the elections watchdog, the Electoral Commission, to designate which of the groups will become the official Leave campaign. The process has begun, with a decision due by the middle of April. The Electoral Commission will judge each applicant's merits on the basis of a range of criteria, such as level of cross-party support, campaign tactics and organisational capacity. The chosen group (as well as the official In campaign) will benefit from increased spending limits of £7m during the campaign period, campaign broadcasts and a free mail-out to households. They all get access to public meeting rooms and to the electoral register, and are entitled to public grants of up to £600,000. What have the camps said about each other? Six months ago, there was talk that the two groups would inevitably end up co-operating with each other and potentially even merging. But relations between the two sides soured amid arguments over their strategies. Efforts at bridge-building have come to nothing. Mr Farage has said Vote Leave is making "Westminster-based" business arguments and that only Leave.EU/Grassroots Out will be able to reach outside to wider audiences. Leave.EU has said its rival was "run by the Westminster bubble". But Mr Carswell has suggested it was a "one-horse race" in favour of Vote Leave to become the official campaign, and dismissed the level of support for Leave.EU, saying: "Getting a whole bunch of likes on Facebook is not the same as winning a referendum." Who will front Out campaign: Johnson, Gove or Farage? Unlike the In campaign, which is clearly being led by David Cameron, the Out campaign has not settled on a single figurehead. This may not happen, with the possibility of key figures such as Michael Gove, Boris Johnson and Conservative employment minister Priti Patel being deployed in rotation to make different arguments and appeal to separate groups. Much will depend on which campaign group wins the official designation and whether there is a head-to-head TV debate during the campaign. This is not guaranteed and both Boris Johnson and Michael Gove have apparently ruled out taking on the prime minister face-to-face. Nigel Farage's role is likely to attract much attention. He has insisted he does not want to lead the official campaign, with some Eurosceptics thinking he would be too divisive a figure to fill that role. He has however said UKIP will "take the lead" in the Out campaign.